In the last few weeks, the ABI (Association of British Insurers) has launched a project which doesn’t look like it has anything much to do with us. That’s deliberate; there’s no ABI branding and not even a hint of a logo. Instead of carefully considered words about the importance of the insurance industry, we have some two dimensional science characters and props including pigeons, gnomes and toxic goo. Our animations have recently started appearing in Facebook feeds. Lasting barely 20 seconds each, they address some of the core concepts we think will improve consumer understanding of general insurance, with matching infographics providing further information. Given that we’ll likely be competing for attention with comedy cat videos and lists of 59 things you never knew about avocado, this project had to look different to usual ABI materials. 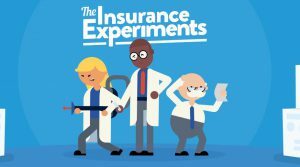 The animations feature a core cast of scientist characters finding out about insurance while working in the lab and relaxing at home. Their mission? To teach people about insurance without them even realising. They’re The Insurance Experiments – and they’re going undercover.